With so many makeup brushes on the market, it’s hard to know which ones to choose and just how to care for them. From selection, to application and maintenance, things can get a bit tricky and we’re often left wondering, “Am I doing this the right way?” The confusion is common, and that’s why we’re here to clear things up. So, put the brush down and pay attention, because we’re filling you in on 10 major things you need to know when it comes to makeup brushes. 1. You don’t need every different kind: There’s endless different makeup brushes that come in all different shapes and sizes, so sometimes we almost feel like we’re missing out if we don’t have them all. However, breaking the bank by buying every brush you see really isn’t necessary — only six brushes are crucial. With a foundation/concealer brush, a powder brush, a contour brush, a crease brush, a blending brush, and an angle brush your collection is complete and you’re more than ready to create any look you want. 2. Cleaning brushes often is a must: Dirty makeup brushes can cause all kinds of problems from causing a muddy application to creating breakouts from the built up bacteria. Cleaning your makeup brushes once a week will help keep your skin clear, your makeup looking flawless, and your brushes lasting longer. 3. A fancy cleanser isn’t necessary: Moisturizing white bar soap, antibacterial liquid soap, and even gentle shampoos are great for cleaning makeup brushes. Just rinse the brushes in water, swirl them into the soap so it lathers up, massage it thoroughly so you’re cleaning all of the brush (not just the tips), and rinse them out until the water runs clear. 4. Never soak them: Soaking the brushes will cause water to seep into the handle, which can then loosen the glue that hold its together and make the brush fall apart. To avoid this, make sure you just hold the bristles, face down, under gently running water. 5. Lay them flay to dry: Once clean, use a dry towel and gently squeeze around the bristles so they’re not soaking wet. Lay the brushes on a dry towel on a table and allow the bristles to hang off the edge of the table. Placing them so that they’re not laying flat against the table will protect their shape. Remember to always lay brushes out to dry closer to windows or fresh air. If you leave them to dry in places with no sunlight, like the bathroom, they’ll grab onto a funny odor, similar to damp laundry. 6. Know the difference between bristles: There are two different kinds of bristles — natural and synthetic. 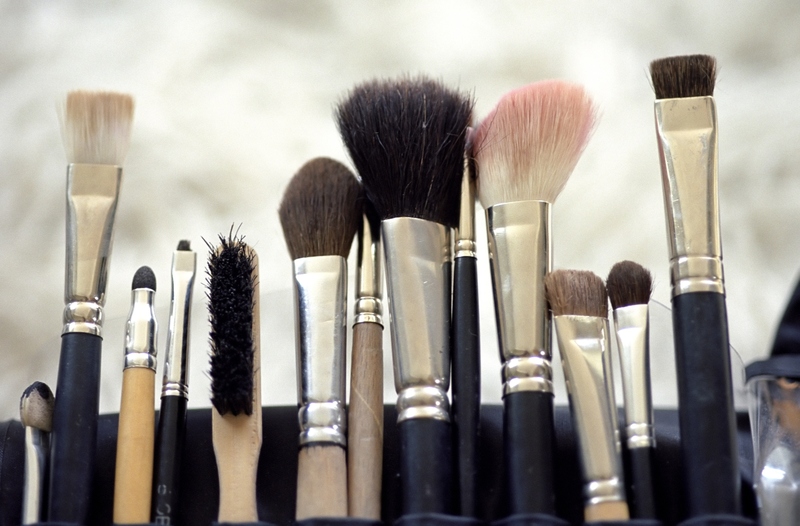 Natural makeup brushes are typically made out of various animal hair, while synthetic brushes are made up of manmade bristles, usually from nylon or other synthetic fibers. 7. Natural makeup brushes are best used with powder products: They work wonders with any powder from bronzers to eyeshadows and everything in between, as they are loaded with texture so you’ll get a better application. Natural hair bristles move freely, allowing you to not only pick up enough product in one swipe, but also to blend it out beautifully. 8. When it comes to liquid and cream products, synthetic brushes are your best bet: Unlike natural brushes, synthetic makeup brushes don’t have a cuticle, which makes them great to use with liquid or cream products because they won’t trap makeup. Synthetic bristles tend to gravitate towards one another, making them ideal for precision application. 9. Size matters: The longer the bristle, the softer the application and coverage. It’s the short bristles that will give you fuller application and coverage. 10. Know when it’s time to say goodbye: If you take care of your brushes, they will last a long time, but nothing lasts forever. If your brush is shedding, or the handle breaks, or you can’t get a brush clean anymore, it’s time to toss the brush in the trash.